← Bring on Lucky 13! 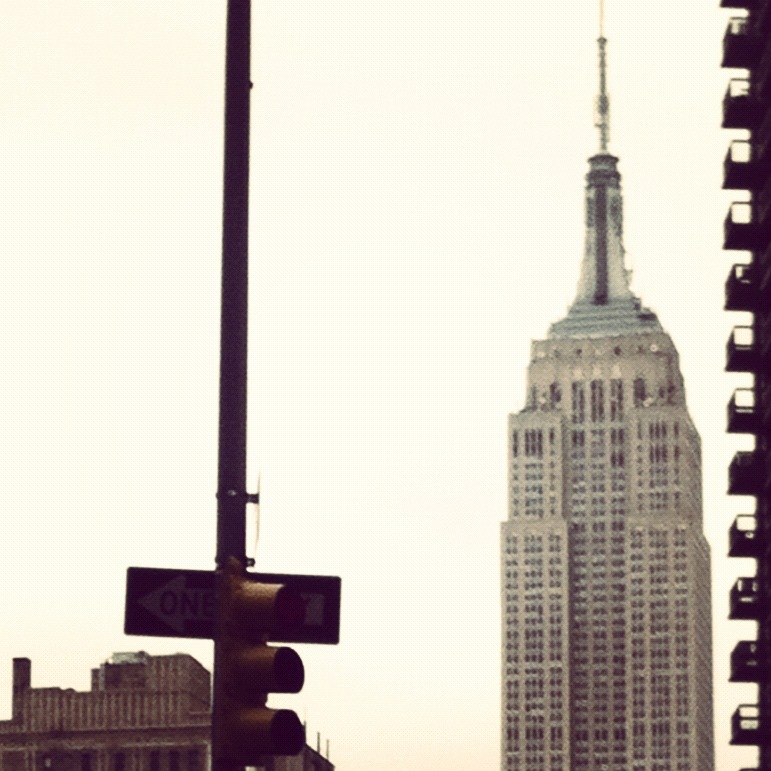 In the past year since I moved to New York City, my life seemed to settle down quite a bit. You’ve probably noticed this because of the slow down on the blog. Don’t get me wrong, New York City is filled with crazy, and every day you take your life into your hands just by walking outside. Literally, going into the subway these days might as well be suicide. But, in the past year, I’ve moved into a great apartment on my own, landed a new job, started volunteering at a cancer hospital…I’m basically awesome and perfect at being a New Yorker. There has been little of the crazy that was following me all over Boston, like when I took my friends out to dinner and we ended up starring in a reality show, or that time the limo with the fully stocked wet bar picked me up on Comm Ave. There was one night at Sparks Steakhouse that was pretty interesting…but I digress. So, yesterday was a big day for me and my godson, Brett. Brett is a very talented actor at his elementary school, and as a fifth grader he managed to snag the part of Rooster in his school’s upcoming production of Annie. 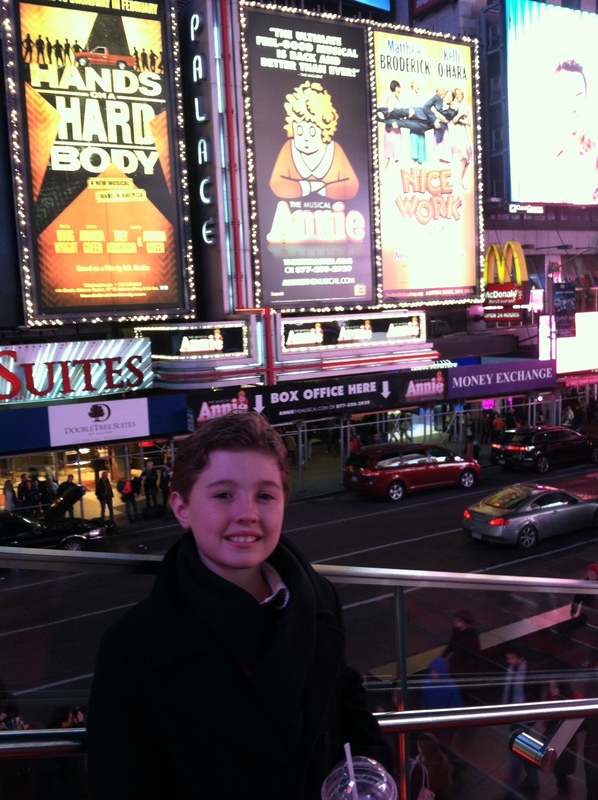 For Christmas, I decided my present to Brett would be a fun outing to see the revival of Annie on Broadway. I’ve never seen this kid so excited when he got his present. I couldn’t wait! We had an awesome day in the city with Brett’s mom and dad and brother. We went to a pub and had burgers and potato skins and all kinds of awful greatness. We went to Dylan’s Candy Bar and had chocolate-covered Rice Krispie treats and milkshakes. We hung out in Times Square and learned the importance of Stranger Danger. Good old American fun. 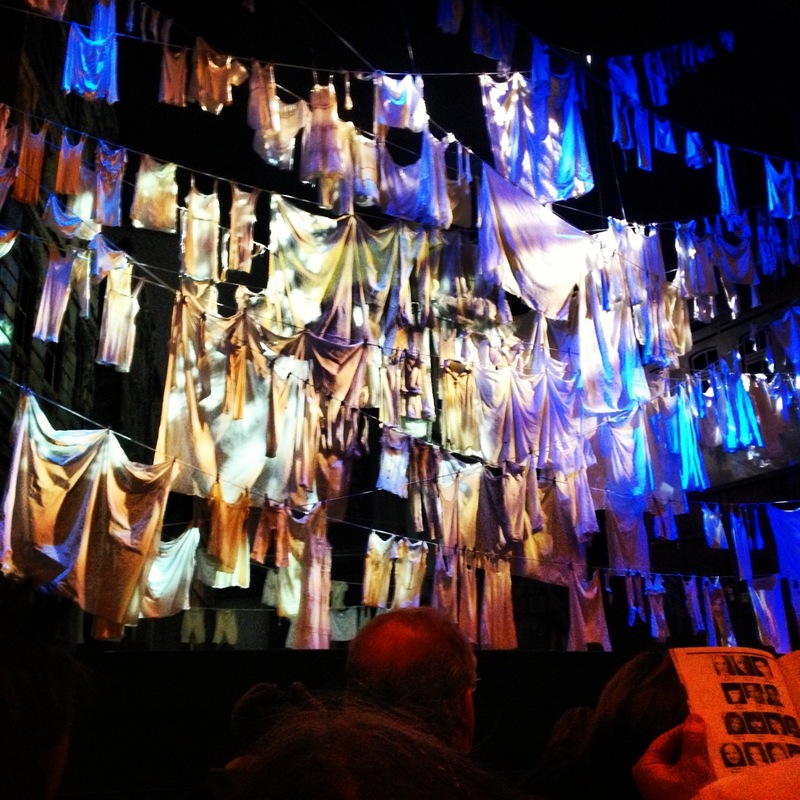 So, Annie is amazing and everyone should go. Brett’s review is that it’s “tied with Newsies,” and seriously, the kid would not stop talking about Newsies all day leading up to our 6:30pm Annie curtain call, so that’s a rave if there ever was one. 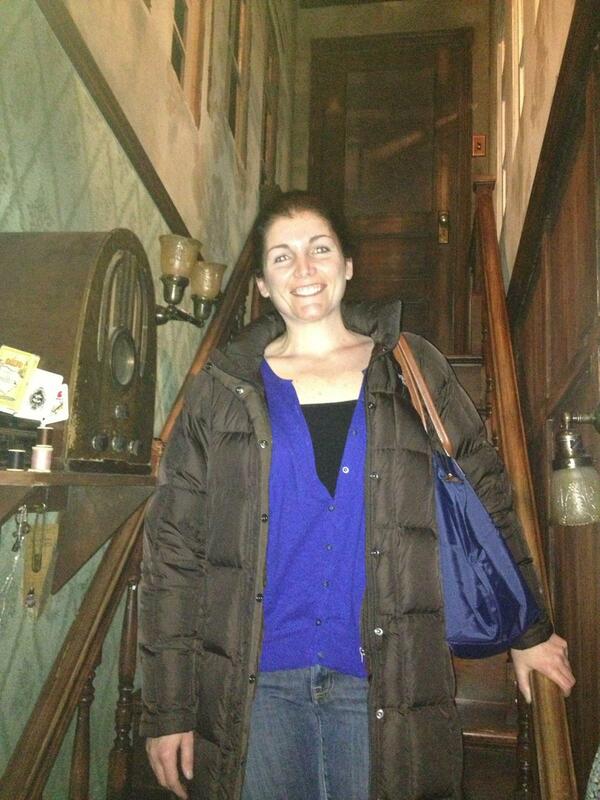 Exiting the theater, I picked up my bag, put on my coat, checked my pockets for my phone and grabbed Brett’s hand. There were about 50 million children around us and I wasn’t taking my chances of some weird child-switch comedy happening to us. We got out a side door, Brett hailed a cab (he’s weirdly good at hailing cabs, he should teach a class) and we headed back to my apartment. It was when I went to pay the cabbie that I realized I didn’t have my wallet. I should have noticed sooner, since the thing is the size of a Chipotle burrito, but I was also carrying around my hardcover copy of the fifth Game of Thrones and a history of the Norman Conquest. You know, some light reading in case there was downtime. So, clearly, I go into full-blown panic mode at this point. Not only have a lost my wallet, but I’ve lost everything I had to get myself around Manhattan and still eat food and whatnot. My credit cards, my license, the key to my office, my work I.D., etc. I had no means of surviving, at all. And no way to pay the cab driver. I could feel the sweat start to form around my hairline and run down my back. Brett adorably attempted to pay $9 of the $10 cab ride (this was all he had in his blue velcro wallet, blesshisheart), but I stopped him. I knew his parents would be there any minute to pick him up, and in my head all I could think was, “no, Brett, this was your present. I will not have you paying for ANYTHING.” Insane. Also, my cab driver was an angel from heaven and kept helping me do breathing exercises and sat with us until Uncle Tom and Aunt Eileen got there. Whoever is in charge of taxicabs in New York City should promote this man. Or give him some kind of power to do counseling sessions whilst driving. Uncle Tom and Aunt Eileen rescued us from the cab and we immediately drove back to the theater. I live on the Upper East Side, so not only are we driving into Times Square and all its awfulness, but we’re also going cross-town, and anyone who is willing to do this for you at 10pm loves you very much (life lesson). When we pulled up at the doors of the Palace Theater, everything was shut and there were no bodies in sight. Aunt Eileen and I moved around the corner to the stage door. To the left was an intercom-like device, so I pushed it in the hopes that someone would answer. Instead the door popped open and there facing us where five gray steps into the oblivion of a Broadway theater basement. Yup, this seems safe. No possibility of getting raped or murdered here. And in we went. Four flights down we were confronted by a man who literally came out of nowhere. It bothers me that my first instinct is never to find some kind of weapon or flail my arms to create some kind of diversion and run. No, when I’m in dangerous situations, I want to TALK to people. I feel that if I explain the situation enough, no harm can come to me. One day someone’s going to drag me off somewhere, and the entire time I’ll be like, “I was just trying to find the nearest restroom. I went into Starbucks, but you have to buy something and I really don’t care for their coffee, but their frappuccinos are pretty good, but it’s just so cold out…” There are defense classes I can take, right? Turns out this dude was not a murderer, or at least he wasn’t last night, and he introduced us to one of the theater’s carpenters who offered to take us to my seat so we could search for the wallet. Apparently after Sunday shows, the entire theater shuts down pretty quickly. The theater doesn’t operate on Monday, and nothing gets cleaned until Tuesday. The More You Know.TM Unfortunately, this didn’t help me because there was no wallet under any of the seats around me. And I started to sweat again. Probably noticing that I started to get sweat curls around my face and that panic was setting in yet again, the carpenter offered to give us a tour of the theater. I was too busy itemizing all the things in Times Square the person with my wallet was buying on my credit cards to form any type of coherent sentence. But Aunt Eileen was all for it. Again, tall stranger taking us two pretty ladies into the bowls of the Palace Theater at 10pm. Flares should have really been going off somewhere. The carpenter showed us all of backstage – where the kids in the cast are tutored, the dressing rooms, the costume office, the wig room, each wing of the stage where the sets are kept. I would have thought it was amazing if I had been able to fully take it all in without the thought of the identity theft that I was sure was occurring AT THAT MOMENT running through my head. But then all of a sudden I moved past the creaky stair set of Mrs. Hannigan’s orphanage and I was in the middle of the stage. Looking out into hundreds of seats. With a spotlight on. 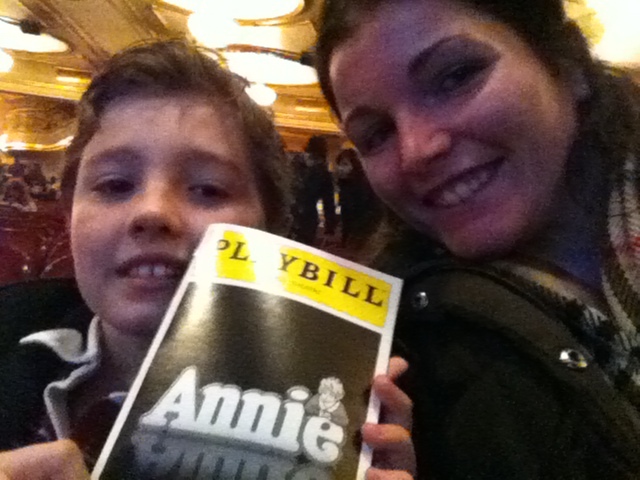 I was standing right where Annie and Daddy Warbucks ended the show. It was something I never in a million years thought would happen. And it was pretty cool. Of course we got back out into the car, sans wallet, and Brett was livid that I lost all the contents of my entire life but got to see the inner-workings of a Broadway theater. These are the breaks, kid. Hopefully he looks back on this day and smiles, because I know that despite losing my wallet, I had an awesome time. If it cost me a few credit cards and a license, then it was worth it. Kelly, its Marcy Turnbull, I just wanted to let u know that after reading ur blog I’m not sure you “lost” your wallet.. You may have easily been pick pocketed.The same thing happened to Kiersten less than a month ago…Lots of pick pocketers in Manhattan…Hope u got everything taken care of it was such a pain having to do all of it.. Your blog readers deserve an update!